These are just a few of the ideals behind the success of Beckville Woodcrafts. 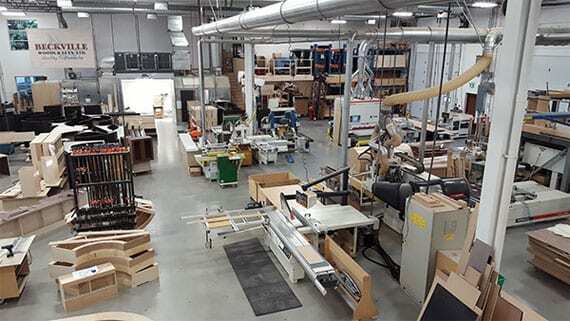 Established in 1981, we are a leading company in both hand craftsmanship and computer precision millwork. We at Beckville Woodcrafts are driven to find the right solutions to your woodworking needs. Whether large or small, we're ready to solve your building challenges. Contact us today to learn more about what sets us apart from the competition. “Beckville Woodcrafts continues to provide the Liquor Distribution Branch with good quality millwork, on time and on budget. “I am writing you at this time to commend you and your people for the outstanding work done on our Victoria store. The store has been very well received in the market and we get constant comments on how good the store looks. “Beckville Woodcrafts has been our first choice for top quality millwork everytime we begin a new project. As a matter of fact, Frank Beck is our only choice.